Caterpillar Local Host Plants: Bambusa_heterostachya (Poaceae; common name: Malay Dwarf Bamboo), Bambusa multiplex (Poaceae, common name: Hedge Bamboo, Chinese Dwarf Bamboo), other Bambusa spp., Dendrocalamus spp. 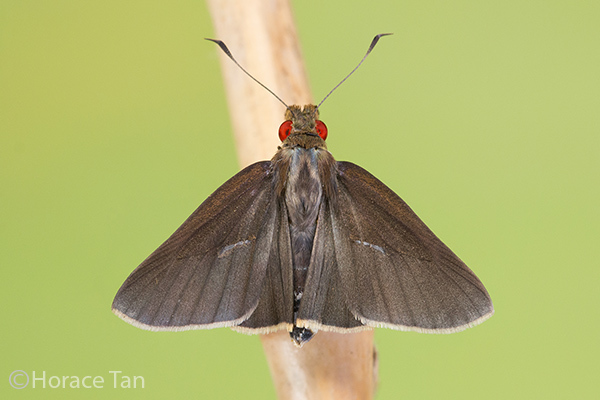 A male Common Redeye showing the brand on the forewing. 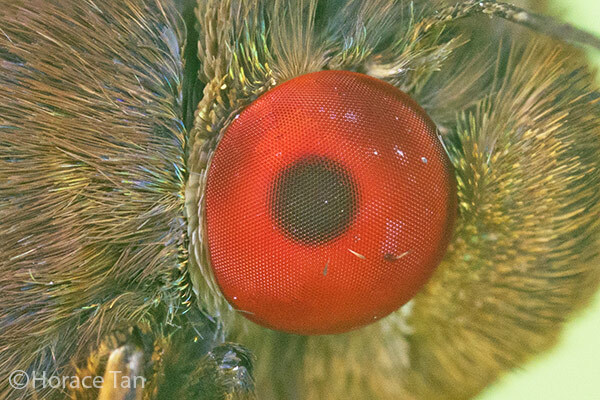 The close-up view of the red eye of a Common Redeye. 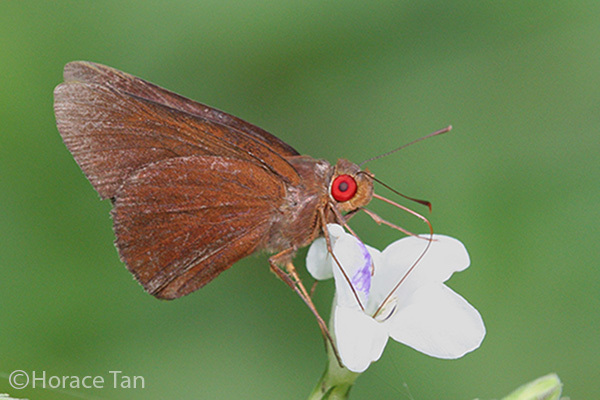 On the upperside, the wings are dark buff brown to black with the hindwing cilia pale yellowish grey. 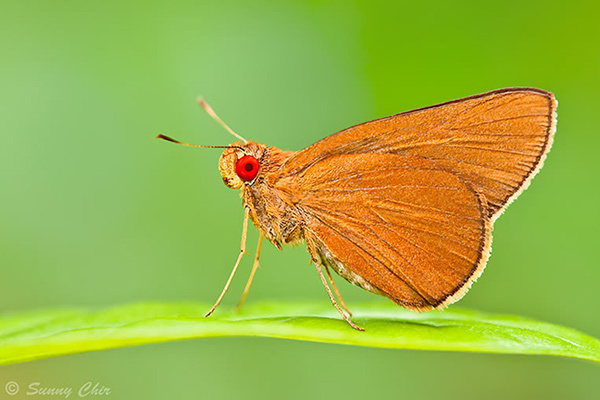 The male has a oblique, greyish brown, brand in spaces 1b and 2 on the forewing. 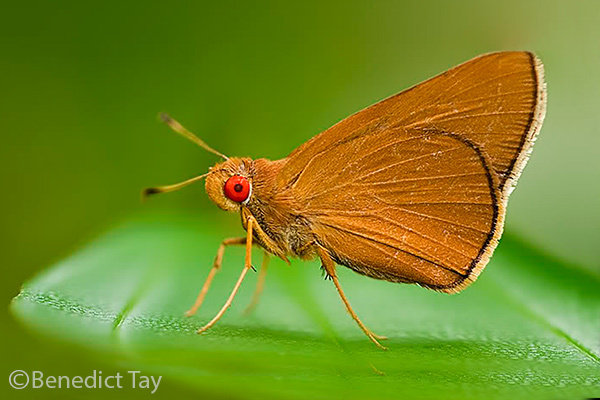 On the underside, the wings are ochreous brown. The eyes are red. 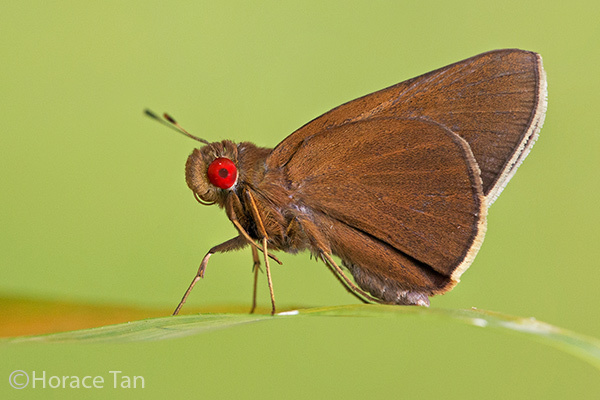 The Common Redeye is moderately rare in Singapore although its caterpillars can be found rather easily on its host plants (various bamboo spp.) on many occasions. The adults are mainly sighted at locations where there are bamboo clumps in the vicinity, and such locations could be urban parks, gardens, wastelands or the nature reserves. The adults are fast flyers and rests with its wings folded upright.